Â Adopted A Puppet is a fun and painless way to involve your congregation in raising funds for more puppets without stretching an already tight budget. Imagine a scenario in which it is revealed to a caring congregation that several young "characters" are facing a homeless life. These individuals are friendly, well-known animals and children who, without personal intervention, will face the coming holiday alone. Â Â Â Â And being the kind and benevolent leader that you are, organize an effort in which many of these yet-to-be-friends can come and reside at your church. Here they will live happy and productive lives, leading and teaching children and adults in a variety of ways. 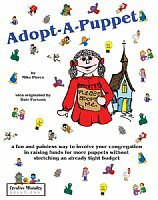 Adopt A Puppet BookÂ will give you outlines for how to make a successful fundraiser for your church. A certificate which entitles you to free shipping when ordering six or more puppets from One Way Street.